Hello all! Hope you are having a great week! We are having a little more snow here in Middle Tennessee but hopefully it won't cause the problems the last snow storm caused. I am really looking forward to Spring! 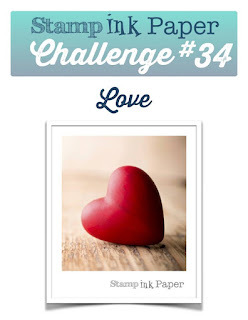 This week it's a Love theme over at Stamp, Ink, Paper. 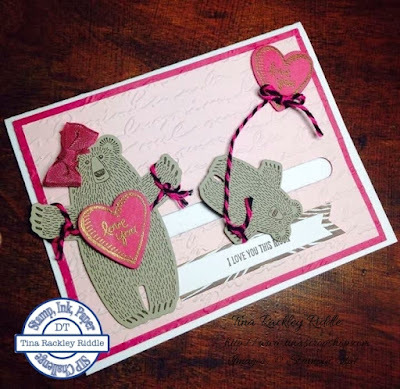 I hope you'll head over and check it out and then link up your own love themed card! This one started off with an A2 Thick Whisper White Cardstock base. I layered a piece of Pink Pirouette onto Rose Red and ran them through my Big Shot with the retired Script Embossing Folder. I used my Word Window Punch to punch out my slider tunnel. To make the slider mechanism, you use two pennies with a dimensional sandwiched between them in the tunnel. Then I placed a dimensional on the top penny before placing my little flipping bear on it. 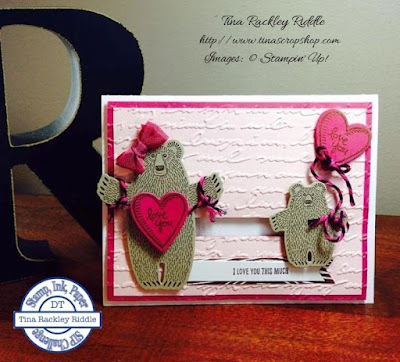 lol I used the new Bear Hugs stamp set and coordinating framelits for my bears, hearts, and sentiment. This was just a fun card and know Laken will have a lot of fun playing with it.